Welcome to my professional page. I’ve written about a few topics related to sustainable development, renewable energy, or energy efficiency. The most recent articles are posted below. You can read my resume to learn about my career. 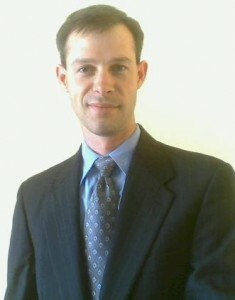 Or you can browse my other Professional posts about topics including renewable energy and sustainable development. This is the sixth article in a continuing series on renewable energy technology. Today we’ll continue our discussion of ocean power. As previously mentioned, the term covers virtually any device that extracts power from the sea. That’s a broad range of technologies, including wave and tidal energy conversion systems or the more exotic concepts of ocean thermal energy conversion (OTEC) and salinity gradient devices. The previous article covered wave energy. This article explores tidal energy and ocean current energy schemes. Most of the power used on this planet comes (directly or indirectly) from the sun. That includes fossil fuels, wind, traditional hydropower, biofuels, wind, solar PV and wave energy. Tidal power comes from the moon, or more accurately, the gravitational interaction between the earth, moon, and the oceans. That makes tidal and ocean current energy unique. But how do tidal and ocean current power systems work? Tidal and current power systems share a lot of characteristics with wind turbines. In mechanical terms, they both extract energy from a fluid (sea water and air, respectively). In simple terms, tidal and current power systems use lunar induced changes in sea level to push water through a turbine, hydrofoil or other device, which turns an electric generator very much like a wind turbine or hydroelectric plant. 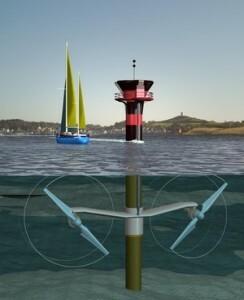 The classic tidal energy system features a turbine placed at the mouth of a tidal estuary, bay, or lagoon. When the tide rises, water flows into the estuary through the turbine. The turbine spins a generator and produces electricity. As the tide drops, water flows back out through the turbine, again generating electricity. The greater the difference between high and low tides, the greater the potential for energy generation. Tidal and current power is generally classified into three main types: barrage systems, tidal lagoons, and tidal stream systems. Classic barrage systems are essentially dams placed across the width of a tidal estuary. They convert potential energy into electricity by capitalizing on the difference in water height across the barrage, in much the same way as a hydroelectric dam. Most traditional systems, like the world’s first tidal power system on the Rance River, use ebb generation methods, which means they only generate power at ebb or low tide. Sluice gates open when the tide comes in, filling the basin behind the barrage. Once the tide starts to fall, sluice gates are shut, trapping the water in the estuary. Once the sea level drops far enough outside the barrage, water is allowed through the turbines to produce power. Once the water level in the estuary drops back to the same level outside the barrage, the turbines are shut down and the sluice gates reopened to begin the cycle again. The alternative to ebb generation is flood generation, where power is generated when the tide is rising, as it is with the Sihwa Lake Tidal Power Station under construction in south Korea. However, it’s easier to maintain a large pressure differential across the turbine using ebb generation, so it’s rare to find a barrage system that uses the flood technique. It’s also possible to use the turbines as pumps, turning a barrage system into a large-scale pumped storage scheme. There aren’t many barrage tidal power systems in the word today, in large part due to their high construction costs and environmental impact. Barrages alter the flow rate of salt-water into and out of the estuary. This can result in changes to salinity, oxygenation, suspended solids, silting, and solar penetration, all of which shift the estuary’s natural ecosystem. Tidal lagoons are similar to barrage systems, but are often built as self-contained structures, reducing the environmental impacts from damming an entire marine estuary. Power lagoons, like the one proposed in 2004 near China’s Yalu River, can be formed in shallow water off-shore by using impoundment walls and low-head turbine generators, like those used in run-of-river or micro-hydropower. Like most renewable technologies though, tidal lagoons are not without controversy. Arguments over which approach to use for a proposed tidal energy project in the Severn Estuary have gone on for years. The debate is fiercest over questions about environmental impact, construction costs, and generation capacity. Tidal stream systems are a different beast. 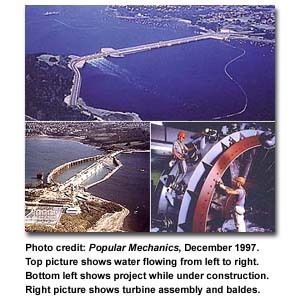 Instead of converting potential energy (from the difference in water height across a barrage or impoundment wall), tidal stream systems convert the inherent kinetic energy of moving water currents to power turbines or hydrofoils. Tidal stream technology is still in its infancy compared to barrages. As a result, the technical approaches are still widely diverse. 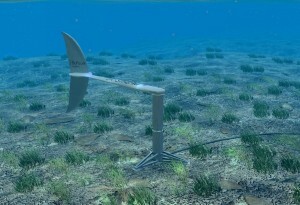 Axial turbines, like those made by Marine Current Turbines and Verdant Power are the most common. They’re quite similar to the horizontal axis wind turbine that dominate the wind energy markets today. Meanwhile, companies like Neptune Renewable Energy and Ocean Renewable Power Company are experimenting with cross-flow turbine designs, counterparts to the wind energy market’s vertical axis devices. These devices feature Darreius or Gorlov type turbines with helical blades that look a little bit like the old-style water wheels that used to power saw mills. However, instead of the water flowing over or under the wheel, it flows directly through the pitched blades, turning the turbine around an axis perpendicular to the flow. Then there are some real innovators in the market, like BioPower Systems and others, who are developing oscillating devices powered by hydrofoils instead of turbines. BioPower’s approach is to use a bio-mimetic design (the tail of a swimming species like shark or mackerel, in this case) to generate power from the flow in ocean currents. Tidal stream devices are an area of growing interest right now. Developers think such devices can be built more cost-effectively than barrage or lagoon systems which require heavy engineering for dams and impoundment walls. Tidal stream systems are also expected to have lower ecological impact, which is another big advantage. Theoretically, any of these designs could be used to tap the energy in thermal ocean currents like the Gulf Stream as easily as tidal currents, which opens up even more opportunity for growth in this sector. It’s pretty clear from the variety of devices in play that the tidal stream market hasn’t converged on an optimal solution the way wind power has over the last decade. The technical challenges of tidal power are different than those wind power technologists have faced, so the solution this market converges toward may look very different than the large horizontal axis turbines that wind power developers have embraced. A sustainable energy source as predictable as the tides would be a real boon for utilities faced with rising demand for clean, renewable power. Unfortunately, tidal power isn’t a perfect fit for every market. As with wind power, tidal power tends to be concentrated in certain belts where geographic conditions favor strong tidal currents and large tidal swells. As with wave energy, tidal power is an immature technology, and it faces challenges in survivability, energy capture, and regulatory restrictions. The survivability issues aren’t quite as severe as they are in wave energy systems, especially for tidal current schemes that can be submerged below the worst effects of severe ocean storms. The ocean is still a harsh mistress though, and designing for for such an environment adds an unavoidable cost component to any ocean power generation system. Regulatory concerns are the main barrier to further construction of barrage systems, and the impetus behind tidal lagoon developments in geographies where barrage systems might have been considered forty years ago. There is a lot of activity in tidal power today. You can find a lot of companies dabbling in the space: joint ventures, prototype projects and big investments from firms putting their weight behind one technology or another. What will we have when the water clears? Hopefully, a focused suite of technologies to add to our growing arsenal of clean, sustainable power generation methods. At the rate world energy demand is growing, we’re going to need everything that we can get to work. In this fifth article in my continuing series on renewable energy technology, I’d like to talk about ocean power. The term covers virtually any technology that extracts power from the sea, ranging from fairly well-known wave energy and tidal energy conversion systems to more experimental ideas like ocean thermal energy conversion (OTEC) and salinity gradient devices. In their own way, OTEC and salinity gradient devices are as different from wave or tidal energy converters as PV arrays are from wind turbines. Since the technologies in this group are so different, I’ll cover them in separate articles. Today’s topic will be wave energy. Countless new technologies have emerged in the wave energy arena since Stephen Salter first threw his hat into the ring over three decades ago with the Salter Duck. They come in a bewildering array of shapes and sizes. How do these wave energy converters work? Wave energy systems extract useful work from the most visible embodiment of the power in the ocean: waves. Waves are generated by the winds, which induce oscillations at the ocean’s surface. The stronger the wind and the longer it blows along the surface of the water, the bigger the waves. Recall from my first article on hydropower that generators work on the principle of magnetic induction: they generate electricity by spinning a loop of wire in the presence of a magnetic field. Wave energy devices work by transforming the elliptical or circular oscillation of sea water into the rotation of a generator. There’s a staggering variety in the mechanisms used to achieve this transformation. Wave energy systems are usually categorized by three traits: the way they capture wave energy, the way they convert that energy to power, and their location. Individual designs can look radically different from each other, since nearly any combination of the above traits is possible. The options for wave energy capture are so diverse that opinions differ on how to categorize them. Point absorbers are floating devices that move up and down with the waves relative to a mooring or inertial reference. The motion can be used to pump water through a turbine, to spin a generator directly with a mechanical linkage, or to drive a linear electric generator. Point absorbers have been used successfully for years in unmanned navigation buoys. Companies like Ocean Power Technologies, Finavera Renewables and CETO Technology are developing products for utility scale power generation using arrays of point absorbers. Attenuators, or surface following devices, are long devices with multiple segments, like floating train cars facing into the oncoming waves. As the segments bend relative to each other from variation in wave height along the length of the train, this motion can be used to turn a generator, through a mechanical linkage or by pumping a fluid through turbine. Pelamis is developing one of the best known examples of an attenuator device, and installed just over 2 MW of capacity in the Agucadoura wave farm in 2008. Terminators are wave energy devices that extend across the wave front, perpendicular to the direction of wave travel (like the direction a surfer travels in a pipeline). Some terminators, like OceanLinx device, funnel the incoming wave energy into an oscillating water column which pushes air through a special turbine that spins in the same direction regardless of the direction of air flow. Other terminator devices use a different strategy call overtopping, where the waves slosh water up ramps into a reservoir. The sea water drains out of the reservoir through a turbine which drives a generator. Wavedragon deployed a prototype of such an overtopping device in 2003 off the coast of Denmark and is currently preparing to deploy a full scale prototype with a 7 MW capacity. 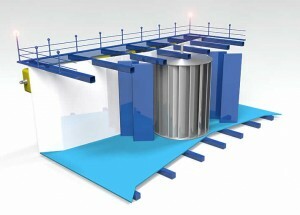 There are other types of wave energy converters a well, unique designs that don’t fit in any of the above categories. Like oscillating wave surge convertors, devices with paddle-like arms that wave back and forth around a pivoting joint as the waves pass over them. Aquamarine Power’s Oyster and BioPower Systems’ BioWave are examples of this energy capture method, though they differ in their approach to power take-off. As if there weren’t enough variety in energy capture method, there are also several aproaches used to convert the captured wave energy into useful power. Some systems use hydraulic conversion methods, pumping sea water through a turbine using hydraulic rams or hose pumps. Hydraulic rams feature a piston in a cylinder with an inlet valve and an outlet valve. As the piston withdraws from the cylinder the inlet valve opens and low pressure sea water is drawn into the device. As the piston reverses direction and compresses, the inlet valve closes and the pressure in the cylinder increases. When the pressure exceeds a threshold the outlet valve is forced open and high pressure sea water is pumped out of the cylinder to a water turbine. Hose pumps deliver high pressure water by mimicking the human digestive tract. Rollers propagate a constriction along the length of a flexible hose, which create high pressure ahead of the pinch point and low pressure behind it. In both cases the high pressure sea water is pumped through a turbine to drive a generator. If the turbine is located with the device, then electric power is transmitted to shore through sub-sea electric cables. Alternatively, the wave energy device can pump high pressure sea water to the shore instead, where it will drive an on-shore turbine and generator. Some systems use air turbines to drive a generator instead of water turbines. Oscillating water column devices fall into this category. Other systems rely on a direct mechanical coupling to a spin a generator or to drive a linear electric generator. These devices usually house the generator at sea with the wave energy device and transmit electric power to the shore via sub-sea electric cables. To add to the spectrum of technical development in the wave energy conversion space, devices can be located in different zones as well. Shoreline systems are located at the beach. Some terminator type devices require solid mooring and are often located on the shoreline. There are near-shore devices, which are optimized for operation in shallow water. And some devices are classified as off-shore, designed for operation in deeper waters farther out to sea.The boundaries between near-shore and off-shore are a little hazy, but systems designed to work in 10-20 meters of water will not operate well in 50-70 meters of water, and vice versa. Wave energy technology, though over thirty years old, is still not as mature as wind energy or solar PV. The biggest symptom of this is the diversity of technologies still under development. The industry hasn’t converged toward an optimal design solution or even on a handful of optimal design solutions. The main challenges that face the wave energy industry are survivability, efficiency of energy capture, and regulatory hurdles, both environmental and recreational. All of these challenges drive up the cost of deploying wave energy projects, and have (so far) prevented the field from approaching competitive footing in any but the most expensive niches in the electric utility market. The big elephant in the room though, is survivability. The marine environment is a harsh one, and not just because of salt-water’s corrosive properties. The areas with some of the best wave resources also suffer from hurricanes and typhoons. Designing to withstand such severe storms leads to large and expensive structures like off-shore oil drilling platforms, but oil has a much higher energy density than ocean waves, and the economics just don’t support wave energy devices that expensive. Some companies, like Sydney’s BioPower Systems, are trying to get clever about this problem with innovative design approaches. In BioPower’s case they are developing biomimetic designs which borrow from nature to improve survivability. But it’s still early days for all of the companies in this space. Who will find the right combination of innovation and engineering to bring wave energy into the mainstream? Only time will tell. My next article will cover tidal and ocean current energy systems. This is the fourth article in my continuing series on renewable energy technology, which I published previously here on Associated Content. Today I’ll be talking about geothermal energy. Like wind and hydropower, most geothermal systems are electromechanical in nature: they generate electricity by spinning loops of conductive wire in the presence of a strong magnetic field. Unlike wind and hydro however, geothermal systems are also thermodynamic in nature: they rely on the coupling between temperature, pressure, and volume in a working fluid exposed to an external heat source. They’re actually much more similar to coal, nuclear, and natural gas burning power plants than other renewable technologies. Have I lost half of you yet? If you’ve read my previous articles in this series, you probably stayed with me through the electromechanical and spinning loops buzzwords. But a thermo-what? A what-dynamic? A what-what? Let me take a step back. Just how do geothermal power systems work? In order to understand geothermal power stations, you have to know a little bit about thermodynamics. I’ll keep it as brief and painless possible, I promise. Let’s start with a substance we all know and love: water. Water is liquid at room temperature and atmospheric pressure. So it doesn’t have a fixed shape, but does have a pretty fixed volume. To prove this to yourself, fill a balloon with water, squeeze out all the air, and squish one side of it between your fingers. It bulges out on the other side right? If you squeeze too hard, the balloon breaks: fixed volume, variable shape. Steam, water’s gaseous phase, doesn’t have a fixed shape or a fixed volume. You can expand it into a large volume or compress it into a smaller one by playing with the pressure, or by heating or cooling the steam. These parameters are thermodynamically coupled. Heat the steam up while maintaining constant pressure and it expands. Conversely, if you cool the steam down at constant pressure it contracts. What happens if you heat water to well past its boiling point but don’t allow it to expand? By sealing it inside a cylinder for example? You get extremely high pressure water that will turn into a jet of steam at the first opportunity. Now imagine that one wall of this cylinder is actually a piston. Can you see where this is going? If you increase the pressure inside the cylinder enough (by adding enough heat) the water will vaporize, expand into steam, and move the piston. If the piston is attached to a crank which produces useful work by turning a shaft, you’ve built yourself the first half of a simple heat engine. Of course now your piston is full of steam at fairly high temperature but low pressure, which isn’t particularly useful. In the second half of the cycle the steam will be ejected from the cylinder and allowed to cool and contract to its original state so you can repeat the process all over again. Traditional power stations, like coal, natural gas, and nuclear plants use this process to transform heat energy into mechanical energy. They then use electromagnetic induction (a loop of conductive wire spinning in a magnetic field) to transform that rotating mechanical energy into electricity to power our utility grid. Sometimes they use fancier stuff than water as a working fluid. And sometimes they use turbines instead of reciprocating pistons, but the underlying concept is the same. 1) Heat a fluid until it changes phase into a gaseous state. 2) Allow the fluid to expand through a controlled mechanism which will extract mechanical power. 3) Let the fluid cool and contract back to its original state (by exhausting heat somewhere convenient) and repeat. 4) Use the mechanical power to drive a magnetic induction generator. In traditional power plants, the heat come from burning a fuel like coal or natural gas, or from a controlled nuclear fission reaction. Waste heat (an inescapable byproduct of any thermodynamic engine) is dumped into the air or into a large body of water near the plant. In geothermal systems, the heat comes from the earth. But even though geothermal power technology is very similar to the workhorse power stations modern utilities rely upon (coal, gas, nuclear) less than 0.5% of the world’s electricity supply comes from geothermal sources. That’s largely because getting access to the heat in the earth’s crust is challenging. Traditional geothermal plants must be built near a hydrothermal resource: a geological formation where heat from the earth’s core rises close enough to the surface to heat a reservoir of trapped water. Formations like this tend to occur near the edges of tectonic plates, regions where volcanoes, earthquakes and hot springs are commonly found. Power plants built on hydrothermal resources fall into three basic categories. Dry steam plants are built where underground hydrothermal reservoirs are filled with steam rather than liquid water. These plants are called “dry” because the working fluid never changes phase. The steam remains in its gaseous state throughout the thermal cycle. High pressure steam is brought to the surface through a production well in order to drive a turbine directly. Once the steam has expanded through the turbine, it can be pumped back down into the reservoir through an injection well. This is the oldest type of hydrothermal plants, first used in Italy in 1904, and still used in The Geysers complex of power stations in northern California. In flash steam systems, the water in the reservoir is heated beyond its boiling point but under such high pressure that it remains in its liquid state. This hot, high pressure liquid is brought to the surface through a production well and injected into an intermediate pressure tank. Some of the water vaporizes, and the resulting steam drives a turbine, which drives the generator. Sometimes the flashing is done in multiple stages to extract as much energy as possible from the thermofluid. As with the dry steam plant, after passing through the turbine, the low pressure steam can be pumped back down into the reservoir through an injection well. This is the most common type of hydrothermal plant in operation today. In a binary cycle plant, the hot water from the reservoir is brought to the surface through a production well and pumped back down into the injection well. But the geothermal fluid never passes through a turbine. Instead, it passes through a heat exchanger along with a secondary fluid that boils at a much lower temperature. The heat from the geothermal fluid flashes the working fluid into vapor which drives the turbine. This approach offers some advantages: the geothermal fluid, with its corrosive minerals deposits and pollutants, never comes into contact with the turbines or generators, and binary systems can be built on resources with lower reservoir temperatures than dry steam or flash systems. For these reasons, most new geothermal plants built on hydrothermal reservoirs will probably be binary cycle plants. The hydrothermal systems described above all require existing underground reservoirs of hot water or hot steam. There aren’t that many places in the world where all the geological factors required to form such reservoirs come together. But there is abundant heat just a few kilometers below the surface all over the world. We just have to get to it. This is the aim of Enhanced Geothermal Systems, or EGS. Sometimes called Hot Dry Rock or Hot Fractured Rock geothermal, EGS projects drill injection bore holes into deep hot rock using techniques first developed for natural gas and oil field exploration. If the hot dry rocks aren’t porous enough, hydraulic stimulation techniques (also initially developed for gas and oil field exploration) can be used to fracture the rock. The result is a porous bed of hot rock which can be flooded with water through the injection wells, effectively creating an engineered hydrothermal system. Once the new reservoir is filled, a production well is drilled and a power station constructed at the surface. Depending on well pressure and temperature, the EGS plant may be a flash steam system, or a binary cycle system. EGS may just be the future of the geothermal power industry. I’d be happy to see it knock coal out of the number one spot in the world’s energy portfolio, but that dream is probably still a decade or two away. There are technology hurdles to overcome, like affordable hard rock drilling techniques, and cost effective resource exploration, just to name a few. But EGS offers us possibilities no other renewable energy technology can: greenhouse gas free power that can be built anywhere, that can run 24/7, and that has the same production capacity as similarly sized coal, natural gas, or nuclear plants. Hey, what’s not to love? This article was previously published without images and figures on Associated Content here.